Tissues are groups of cells that have a similar structure and act together to perform a specific function. The word tissue comes from a form of an old French verb meaning “to weave”. There are four different types of tissues in animals: connective, muscle, nervous, and epithelial. In plants, tissues are divided into three types: vascular, ground, and epidermal. Groups of tissues make up organs in the body such as the brain and heart. Connective tissue connects or separates groups of other tissues. It is found in between all the other tissues and organs in the body. Connective tissue is made up of cells and ground substance, which is a gel that surrounds cells. Most connective tissue, except for lymph and blood, also contains fibers, which are long, narrow proteins. Fibers can be collagenous, which bind bones to tissues; elastic, which allow organs like the lungs to move; or reticular, which provide physical support to cells. Connective tissue also allows oxygen to diffuse from blood vessels into cells. About 1 in 10 people are have a disorder involving connective tissue. Some connective tissue disorders include sarcomas, Marfan syndrome, lupus, and scurvy, which is a Vitamin C deficiency that leads to fragile connective tissue. Muscle tissue comprises all the muscles in the body, and the specialized nature of the tissue is what allows muscles to contract. There are three types of muscle tissue: skeletal muscle, cardiac muscle, and smooth muscle. Skeletal muscle anchors tendons to bones and allows the body to move. Cardiac muscle is found in the heart and contracts to pump blood. Smooth muscle is found in the intestines, where it helps move food through the digestive tract, and it is also found in other organs like blood vessels, the uterus, and the bladder. Skeletal and cardiac muscles are striated; this means that they contain sarcomeres (a unit of muscle tissue) that are arranged in a uniform pattern. Smooth muscle does not have sarcomeres. Duchenne muscular dystrophy is an example of a muscle tissue disorder. It is an inherited disorder that causes muscles to atrophy over time. The muscles shorten as they atrophy, which can cause scoliosis and immobile joints. Individuals with the disorder are usually male because the gene responsible for it is found on the X chromosome (of which males have only one). Nervous tissue is found in the brain, spinal cord, and peripheral nerves, which are all parts of the nervous system. It is made up of neurons, which are nerve cells, and neuroglia, which are cells that help nerve impulses travel. Nervous tissue is grouped into four types: gray matter and white matter in the brain, and nerves and ganglia in the peripheral nervous system. The main difference between gray and white matter is that axons of the neurons in gray matter are unmyelinated, while white matter is myelinated. Myelin is a white, fatty substance that insulates neurons and is crucial for nervous system functioning. The symptoms of Alzheimer’s disease, such as memory loss, mood swings, and confusion, are caused by the breakdown of nervous tissue. Amyotrophic Lateral Sclerosis (ALS) is another disease that causes nervous tissue to degenerate, which leads to the loss of higher brain functions over time. Other nervous tissue disorders include multiple sclerosis, where the immune system attacks and destroys nervous tissue, Huntington’s disease, where an abnormal protein causes neuron death, and Parkinson’s disease, where the part of the brain that controls movement is impaired because not enough dopamine is produced. This image is a microscopic view of nervous tissue. It is a cross-section of a peripheral nerve. Epithelial tissue, or epithelium, covers the surfaces of organs including the skin, the trachea, the reproductive tract, and the digestive tract’s inner lining. It creates a barrier that helps protect organs, and it also has roles in absorbing water and nutrients, getting rid of waste, and secreting enzymes or hormones. All of the body’s glands are formed from ingrowths of epithelium. Some common epithelial tissue diseases are skin diseases like eczema and psoriasis, which both cause rashes. When cancer develops from epithelial tissue, it is called a carcinoma. Epithelial cells in the airways are also responsible for asthma, which is characterized by inflammation of the airways that leads to shortness of breath. Vascular tissues in plants transport substances throughout the different parts of the plant. The two types of vascular tissue are xylem and phloem. Xylem transports water and some soluble nutrients, while phloem transports organic compounds the plant uses as food, particularly sucrose. Vascular tissues are long and thin, and form cylinders that nutrients are transported through like pipes. Vascular tissue is also involved with two types of meristems, which are tissues that contain undifferentiated cells that are used during a plant’s growth. The meristems accompanying vascular tissue are the cork cambium and the vascular cambium. These meristems are associated with the growth of the plant’s vascular tissues. Ground tissue is made up of all cells that are not vascular or dermal (having to do with the epidermis; see below). There are three types of ground tissue: parenchyma, collenchyma, and sclerenchyma. Parenchyma cells form the “filler” tissue in plants, and perform many functions like photosynthesis, storage of starch, fats, oils, proteins, and water, and repairing damaged tissue. Collenchyma tissue is made up of long cells with irregularly thick walls that provide structural support to the plant. Plants that grow in windy areas have thicker walls of collenchyma tissue. 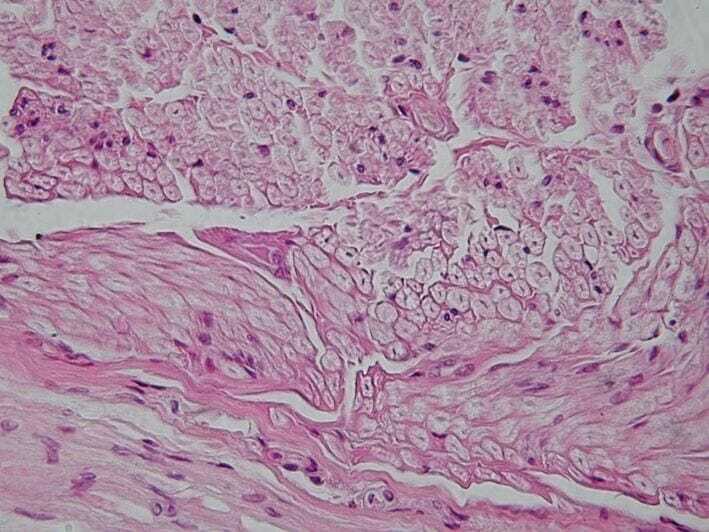 Sclerenchyma is also supporting tissue, but it is made of dead cells. There are two types of sclerenchyma: fibers and sclereids. Fibers are long, slender cells, while sclereids are star-shaped with thick cell walls. Sclerenchyma fibers make up fabrics such as hemp and flax. The epidermis is made up of a single layer of cells that covers a plant’s roots, stems, leaves, and flowers. (Epidermis is also the word for skin in human anatomy.) It guards the plant against water loss, regulates the exchange of carbon dioxide and oxygen, and in roots, it absorbs water and nutrients from the soil. The epidermis on a plant’s stems and leaves have pores called stomata, which carbon dioxide, water vapor, and oxygen diffuse through. Epidermal cells are themselves covered by the plant cuticle, which contains mainly cutin, a waxy substance that protects against water loss. Plants in deserts and other arid regions often have thick cuticles to help conserve water. Cell – the basic biological unit of living things; groups of them form tissues. Organ – a self-contained group of tissues that performs a specific function in the body. Sarcomere – a unit of striated muscle tissue that contains the filaments actin and myosin. Meristem – a region of undifferentiated plant tissue found at the site of new plant growth at the tips of roots and offshoots of stems. 1. Which is NOT a type of plant tissue? B is correct. Ground tissue, epidermal tissue, and vascular tissue are the three general types of tissues found in plants. Connective tissue is a type of animal tissue that connects or separates other tissues, and it also includes lymph and blood. 2. Alzheimer’s disease is associated with the breakdown of what type of tissue? C is correct. Individuals with Alzheimer’s disease suffer from a breakdown of nervous tissue, which is the tissue found in the brain and spinal cord. When this tissue breaks down, it causes memory lapses, mood swings, and confusion, among other symptoms. 3. What is a function of epithelial tissue? A is correct. Epithelial tissue covers the surfaces of organs in animals and protects them from damage. Choices B, C, and D represent epidermal, vascular, and muscle tissues, respectively.